Provide comfort for the family of Josie Gibbs with a meaningful gesture of sympathy. Mrs. Josie Gibbs, age 103, passed away Friday, March 15, 2019 at Trend Health Systems in Carthage, MS. Visitation will be Saturday, March 16, 2019 from 5:00PM until 8:00PM and Sunday March 17, 2019 from 1:00PM until 3:00PM at Hazel Baptist Church in Lake, MS. Funeral services will be held Sunday March 17, 2019 at 3:00PM at Hazel Baptist Church in Lake, MS with Bro. Larry Laird, Bro. Victor Bugg, and Bro. Sam Taylor officiating. Burial will follow in the Hazel Baptist Church Cemetery. 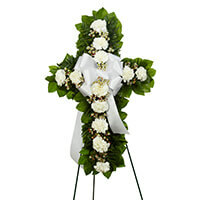 Wolf Funeral Services in Lake, MS is in charge of the arrangements. Mrs. Gibbs lived in Lake, MS for the past 85 years. She was Baptist by faith and was a member of the Hazel Baptist Church where she was acknowledged as their oldest member. Mrs. Gibbs loved vegetable gardening, crocheting, and quilting. She also loved to cook and spend time with her family. She is preceded in death by her husband, Fred Gibbs; her son, Sammy Gibbs; her grandson Michael Gibbs; her twelve brothers and sisters. She is survived by her son, Jimmy Dale Gibbs (Jimmie Dale) of Lake, MS; five grandchildren, Kenneth Wayne “Toby” Gibbs, Chris Gibbs, Billy Gibbs, Shannon Duke, Brian Gibbs; eleven great-grandchildren; eight great-great grandchildren a number of nieces, nephews, and other relatives. In lieu of flowers, memorials may be made to Pine Ridge Baptist Church Building Fund, Pine Ridge Road, Lawrence, MS.
To send flowers in memory of Josie Ethel Gibbs (Shoemaker), please visit our Heartfelt Sympathies Store. We encourage you to share your most beloved memories of Josie here, so that the family and other loved ones can always see it. You can upload cherished photographs, or share your favorite stories, and can even comment on those shared by others. Agnes Rawson Paula Kay Rosa Lynn Kay family sent flowers to the family of Josie Ethel Gibbs (Shoemaker). Agnes Rawson Paula Kay Rosa Lynn Kay family purchased the STANDING CROSS-WHITE for the family of Josie Gibbs.